Mustique | Officina In s.r.l. Maltese designer Gordon Guillaumier designed Mustique for Lema, a comfortable sofa, perfect for closed configurations, at best in the leather version, it is wide yet elegant alongside being essential and formal, its name refers to an island of the Grenadines influenced by the idea of a live and happy place where you are destined to relax. A structure consisting of two “Hs” in burnished or brushed metal, with a thin section, supporting the upholstered linear base unit, covered by the seat cushions, creating a double soft layer making the design more linear. 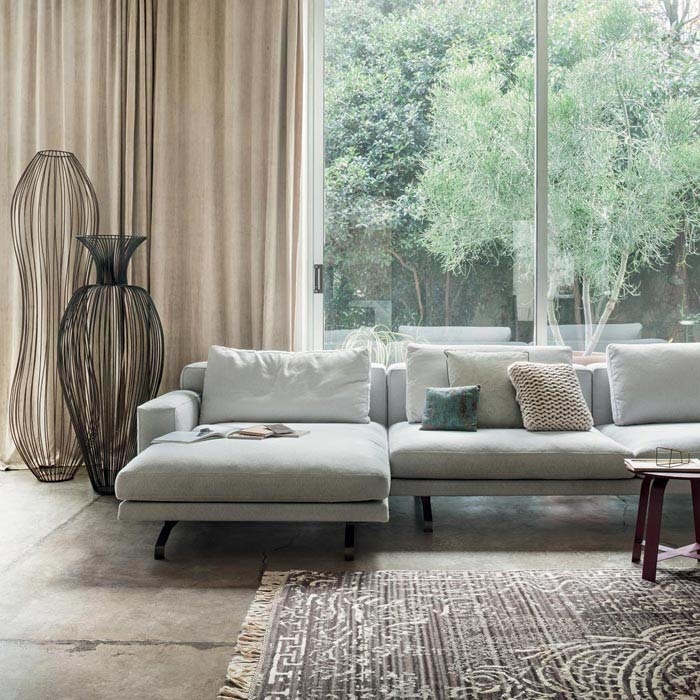 Cushions are all regular in shape, a parallelepiped, in different sizes according to the functions, and coverings are rendered more precious by a detailed sewing following and underlining each shape. A calibrated composition offers a perfectly balanced design, a sort of neo-plastic composition where each unit is correctly placed and plays its role. Soft surfaces with rounded corners stand out for the additional high cushions, bent to follow the back.